When choosing which films to review on our show, it is usually a very simple process. We pick movies that people want to see, have already seen or are in some way uniquely positioned for our audience. Politics have never play a role in our decision – until now. This should have been a very easy decision. 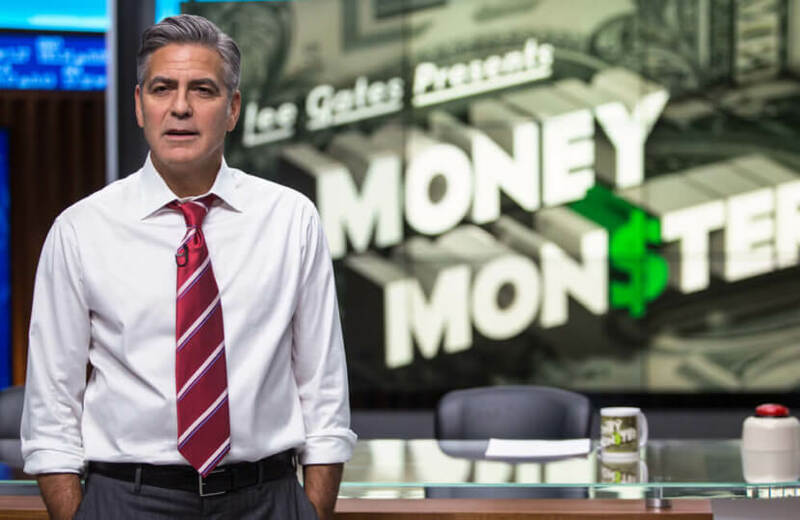 Money Monster opened to over 3,000 screens, Hollywood A-lister George Clooney stars beside Julia Roberts and financial sector corruption/conspiracy is a very hot topic these days. It is also directed by multi-talented Jodie Foster. We already reviewed the main box-office competition, Captain America: Civil War and The Jungle Book. Between the first trailer in January (when we were very excited about the film), and its release this weekend, a funny thing happened: Hillary Clinton. Anyone who listens to our show knows how much love, admiration and respect we have for Sen. Bernie Sanders. His views on a moral economy, healthcare for all, equality and education are clearly the way to a better future for all Americans. The average campaign contribution of $27 demonstrates that everyday people are behind his cause. On his behalf, we have phonebanked, facebanked, designed shareable social media images and brainstormed anything else we could think of to help the cause. We are proudly “Burners for Bernie” and air a short update segment on the primary race each week on the show. Observing the nomination process closely for several months now, it is no secret that Sanders is fighting an entrenched and inflexible Democratic establishment along with their big money donors every step of the way. The corporate media has actively worked against the campaign by providing minimal coverage, routinely suggesting that he should drop out of the race and touting Clinton’s inevitability. The tornado of voter suppression, election fraud and unbudging superdelegates are making this electoral process feel less like the will of the people (democracy), rather the will of those in power. Of concern is the striking confluence of the film's narrative with George Clooney's recent and highly-publicized fundraising efforts on behalf of Hillary Clinton. The weekend of April 15th, George and Amal Clooney hosted two $33,400 a plate fundraisers for Clinton. For a mere $343,500 you could even pay to sit at the head table with Clinton and the Clooneys. These combined events, involving relatively few people, raised an estimated $15 million for Hillary’s Super PAC. Remember, Clinton claims to be against Citizens United, which allows this gross subversion of campaign finance laws to take place. Turns out George was wrong. “Less than 1 percent of the $61 million raised by the Hillary Victory Fund has stayed in the state parties’ coffers, according to a POLITICO analysis of the latest Federal Election Commission filings.” (2) The vast majority of the money was recycled (laundered?) directly back into Clinton’s campaign. Getting back to Money Monster, it is difficult to know if Clooney believed what he was saying or was misled along with so many others by the dark side of Clinton’s campaign. He is certainly free to support and believe whomever he wants. However, the irony is a bit too rich for our blood. Clooney has played a central role in giving Clinton access to those with significant wealth and power. These events concern us as much as all the other special interests giving millions upon millions of dollars to her campaign. This includes Wall Street, fossil fuels, big pharma and private prisons. Are we really to believe they expect nothing in return? Starring in a film tackling financial corruption while at the same time "hosting" shady campaign fundraising events is perplexing, hypocritical and just outright wrong. For this reason, dear listeners, we will not review Money Monster on The Smoking Screen Podcast. While George Clooney was not the only person working on the film, he is the star, face and spokesperson. Instead, we have chosen to donate the cost of our tickets to the Sanders campaign.